FILE - Protesters take part in a rally in Taipei against Taiwan being excluded from U.N.'s annual World Health Assembly (WHA) in Geneva, Taiwan, May 21, 2017. Taiwan can turn a failed bid to join the World Health Organization's annual assembly in its favor this year by generating moral support in its struggle against political rival China, experts say. Diplomatic allies of Taiwan asked the United Nations organization this month to let it join the 71st World Health Assembly as an observer after being turned down last year. WHO members set policies and approve a budget at the annual assembly. 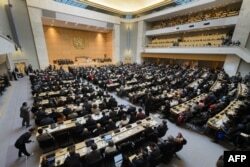 FILE - A general view at the opening of the World Health Assembly, with some 3,000 delegates from its 194 member states in Geneva, Switzerland, May 23, 2016. But Taiwan is widely expected to miss its bid this year for the May 21-26 event because China’s diplomatic allies dominate the WHO. China sees Taiwan as part of its territory, not as a state with rights to join international bodies. Taiwan left the United Nations in 1971 as China came on board. A failed effort to observe the World Health Assembly would still give Taiwan limelight overseas for drawing attention to its billions of dollars’ worth of medical charity — an argument the government in Taipei uses to push its bid — analysts say. The bid, failed or otherwise, would also make China and the WHO look more interested in politics than health, they add. Legislators from the United States, German diplomats in Taipei and officials in the tiny African nation of Swaziland, for example, have already voiced support. The U.S. Congress unanimously backs Taiwan’s bid, said Coen Blaauw, executive director of the Taiwan advocacy group Formosan Association for Public Affairs. 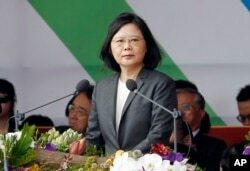 China let Taiwan observe from 2009 to 2016 as Taiwan’s president at the time accepted Beijing’s idea that that each side belongs to a single China. Today’s president, Tsai Ing-wen, rejects that idea. Taiwan normally touts healthcare achievements when it applies to the assembly, effectively reminding other countries of its ability to help. Taiwan gave medical aid to Haiti after an earthquake in 2010 and to Nigeria in 2014 for the fight against Ebola. The Taiwan Medical Association said April 18 the island has spent $6 billion on international health activities and aid, helping people in 80 countries. This packaging of medical achievements with the World Health Assembly bid draws support from “most people in policy circles,” said Raymond Wu, managing director of Taipei-based political risk consultancy e-telligence. Policymakers believe China’s objections to Taiwan over dialogue conditions should not get in the way of its right to join the assembly, he said. China at the same time looks bad internationally for blocking Taiwan on political grounds, Wu said. “If we’re thinking we’re brothers, China and Taiwan, then shouldn’t the big brothers in China be concerned about these health issues in Taiwan, too?” Wu asked. Taiwan must keep trying for World Health Assembly plus other U.N. agencies to “test the boundaries,” said Joanna Lei, chief executive officer of the Chunghua 21st Century think tank in Taiwan. Relations with China have fallen from cordial to strained since Tsai took office, but scholars say Beijing still hopes for an eventual dialogue. Beijing insists that China and Taiwan eventually unify, but opinion surveys in Taiwan find most citizens oppose that ambition. Taiwanese leaders usually make a series of public statements to back their bids for international agencies. Last year a Taiwan government-led group held events outside the assembly venue in Geneva. Taiwan’s health minister said in March his government would protest against organizations that “suppress” Taiwan. Some Taiwanese will eventually worry about wasting time and money if too many bids fail, Lei said. They might ask whether Tsai’s government should do more to get along with China, she said.